Mawatle Jeremiah (Jerry) Mojalefa was born in 1948 at Steelpoort, in the Republic of South Africa. He is a professor of literature and linguistics in the Department of African languages of the University of Pretoria, where he specialises in Sepedi and Setswana, two of the Republic’s official languages. Sepedi is spoken by an estimated 4 million people, in the provinces of Limpopo, Mpumalanga, Gauteng, Northwest and Free State; and Setswana by approximately 3.7 million people, mainly in the provinces of Northwest, Northern Cape, Free State and Gauteng. Jerry has published more than 20 books in Sepedi, Setswana and English, including novels, collections of short stories, plays, folklore, poetry, essays and works on language and linguistics. His scholarly works include: Kgolo le Tšwelopele ya Mongwalo le Mopeleto wa Sepedi, 1862-2003/4 [The Growth and Development of Sepedi Orthography and Spelling, 1862-2003/4)] (2007), and the Festschrifft Rabadia Ratšhatšha: Studies in African language literature, linguistics, translation and lexicography (ed. M. Mojalefa, 2007). He is also currently compiling the Sepedi Bilingual Plant Name Dictionary. He frequently attends international literary and scholarly conferences and has organised and hosted several congresses himself. 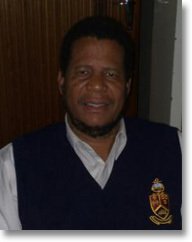 He has also been a visiting professor at German universities, including Leipzig, and been involved in many projects involving research on underprivileged and marginalised indigenous languages in the Republic of South Africa, for example, a Sepedi pilot research project on the collection and recording of the traditional literary art of the Bapedi (1998 & 1999).